The governments of the United States, the State of Israel, the Hellenic Republic, and the Republic of Cyprus met yesterday in Jerusalem to affirm their shared commitment to promoting peace, stability, security, and prosperity in the Eastern Mediterranean region. 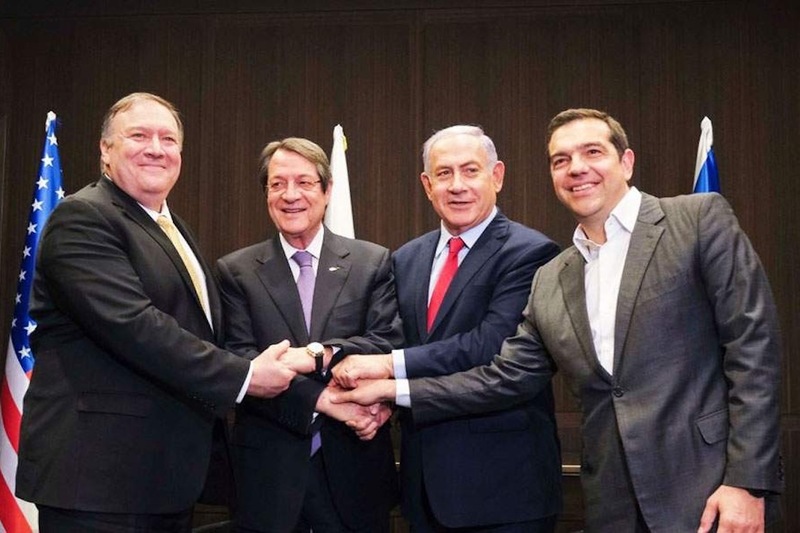 American Secretary of State Mike Pompeo underlined U.S. support for the trilateral mechanism established by Israel, Greece, and Cyprus, noting the importance of increased cooperation. US Secretary of State Mike Pompeo took to Twitter to share photos and praise the “productive meeting” with the leaders of Greece, Cyprus and Israel in Jerusalem. “The US strongly supports our democratic allies in their endeavor to expand cooperation and invest in the future of their energy markets,” Pompeo added. While not clarified or mentioned in the agreement specifically, many see the alliance forming as a direct response to Turkish aggression in the region. Endy Zemenides, executive director of the Hellenic American Leadership Council connects the dots and makes a direct link. “Secretary Pompeo’s participation in the latest Greece-Cyprus-Israel trilateral is significant milestone in tinge Eastern Mediterranean coming together as a political and economic region,” Zemenides told The Pappas Post.